I’m on a mission and this time it’s not about mobile apps or technology. My mission is to half the consumption of bottled water waste in the home in 10 years. This means a reduction of over 4 billion plastic bottle waste per year and about €1.2Bn in money saved in Spain alone. Every mission has a story and mine begins in beautiful Barcelona where I moved 10 years ago. A couple of years ago I started questioning why I and so many people buy bottled water in Spain and other Mediterranean countries. I’m from Sweden where we are used to drinking tap water and I was tired of carrying home the bottles and seeing the plastic waste build up every day. I had tried out the Brita carafe but didn’t think the taste was good enough and thought the filtering process took too long. There must be a better solution. As an entrepreneur I see opportunities with every problem and here was a huge problem to solve. So why should you switch to tap water? Don’t take my word for this. The World Health Organization, water institutes around the world and doctors frequently publish reports stating that tap water is safer or as safe as bottled water for your health. Read more about the facts of tap water in my next blog.. It takes about 2-3 liters of water to produce every liter of bottled water. Although PET is an improvement from previous plastics, most bottles never get recycled and end up in landfills or the oceans. Add to that transportation and it gets even worse. Yes, the tap water in large parts of Spain and other Mediterranean countries tastes bad. However, the bad taste can easily be removed through several methods including filters, tablets and adding citrus fruits. According to several blind tests 9 out of 10 people cannot taste the difference between filtered and bottled water. And if you prefer sparkling water just buy a soda streamer or similar product. 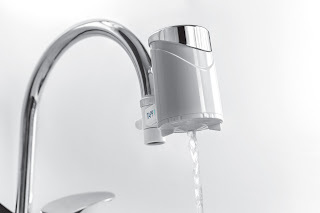 Unlimited fresh water from the tap whenever you need it for drinking, cooking, coffee, tea or watering of sensitive plants. With Tapp Water you get reminded whenever you need to replace the filter. And just buy a nice refillable bottle and you will have tap water with you anywhere. Now the next big challenge is convincing other people to shift from bottles to tap water. This won't be easy but few missions are. I need your help. Whether you use TAPP or another filter, help reduce plastic waste and save money. Fore more facts about drinking water see Facts and insights about tap water. We have the Brita filter at home and it does a lot to the taste and that is good. I have tested the water with an EC/TDS meter and there is no particle (PPM) difference before or after with the Brita filter, not as with a reverse osmosis system which takes away alot. We have been thinking about geting a RO system, but have learned that they produce a lot of waste water as well, for every clean liter of water they use two to three times the amount, which can be a downpart if you pay for the water as in Barcelona. Also they tend to cost a bit and often (not always) require a professional to install them. However in the long term I think the benefits will be greater anyway, clean water, no carying plastic bottles from the store and less plastic waste. Thanks for the feedback. I assume it's a faucet GAC filter? We have the exact same results for TAPP. And you are absolutely right about RO systems. The best option is an Ion Exchange system if you want a full house one but it's a lot more expensive.